The artist profiles on this DVD examine how Japanese American artists determined their particular creative directions in response to a unique set of post World War II social, cultural, and political circumstances. Whatever form their creativity took, these artists brought fresh and compelling viewpoints to the cultural landscape of the region, and their work resonates in the attitudes and institutions that continue to shape Southern California communities. Includes artist profiles of Gidra magazine, Matsumi Kanemitsu, Nobuko Miyamoto, Robert Nakamura, Linda Nishio, Ben Sakaguchi, Larry Shinoda, Qris Yamashita, Bruce Yonemoto and Norman Yonemoto. 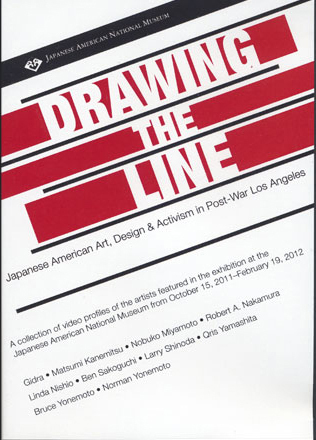 In conjunction with the Drawing the Line: Japanese American Art, Design & Activism in Post-War Los Angeles exhibition.